Electronic Specifier Editor Joe Bush talks to Graham Grose and Espen Olsen of IFS Aerospace & Defence, about the company’s IFS Applications enterprise software and how it is assisting clients in the aerospace and defence sector to improve the management of their assets. To bring an example of this to life, IFS was heavily involved in the biggest defence deal in history - the F-35 Joint Strike Fighter. In a typical high value military fast jet project it is interesting to note that only 20-30% of the project’s whole life costs are usually related to the development and manufacture of the aircraft. Seventy-eight percent is taken-up by project support and maintenance (and this is where IFS is involved). To put that into some perspective, improving support and maintenance processes of a modern fast jet could typically contribute continued savings of ten percent in this area – a figure that could facilitate the funding for another 190 on a large global fleet. Indeed, the potential savings in this area cannot be underestimated. Figures from the US Airways Group shows that in a hypothetical commercial flight carrying 100 passengers, it takes the fares and fees from 99 of those seats to cover all of the flight’s costs. Therefore, a ten percent reduction in maintenance costs could lead to a doubling of profits. 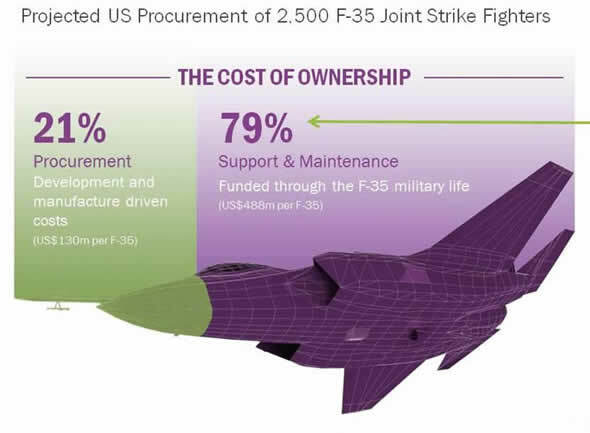 Commenting on the F-35 project, Grose added: “We worked with the OEM (in this case Lockheed Martin), on how they and their partners can deliver this PBL (performance-based learning). This is very topical, because the first big meeting took place recently between the Ministry of Defence (MOD), Lockheed Martin and BAE, and the first moves were put in place for RAF Marham to receive the F-35 in 2018. We’ve been part of the F-35 programme since 1999, all the way through from the competition phase, and we deliver the part of the project that links the aircraft to the autonomic logistics system – i.e. the ability to understand the aircraft and the faults and requirements that are coming from it prior to landing so that engineers can be on hand with the correct spares, tools and equipment to improve the turnaround time of the asset. “Being able to get closer to the asset represents an opportunity for all software providers. What IFS offer is a very flexible technology that can adapt to enable customers to take advantage of emerging technology. If you take the example of augmented reality (which is something that’s right at the cutting edge of technology) it has enormous potential but is relatively too unproven for us to bring in our own augmented reality solution at the present time. However, we do have a partner who provides that. So we are able to demonstrate how a technician positioned somewhere remote from the asset is able to actually diagnose a fault and give an engineer a solution to fix it,” Grose continued. This means that solutions will begin to move to being interfaced with the enterprise solution, with feeds of maintenance information being two-way and in real time. IFS Applications consists of a selection of software modules and, on identifying the scope of a client’s business, IFS can help the client pick and choose any of the modules available, put them together and configure the client’s solution around it - meaning the client doesn’t end up with something they don’t need.